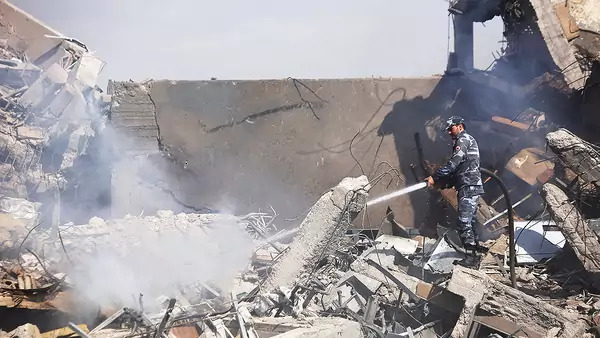 Air strikes on Syrian targets by the United States and its British and French allies may have set back Syria’s use of chemical weapons against its domestic opponents and civilians. Yet only a sustained, U.S.-led international effort will end Assad’s use of these banned weapons, says CFR’s Lori Esposito Murray in a written interview. Despite international efforts to remove its stockpile, Syria clings to a residual chemical weapons capability, which it has used effectively to defeat rebel strongholds, says Murray. Failure to end its program will have repercussions far beyond Syria’s conflict zones, she says. Did the U.S.-French-British strikes degrade Syria’s chemical weapons capacity? U.S. defense officials described the strikes as causing Syria to lose years of research and development data, specialized equipment, and expensive chemical weapons (CW) precursors. But the Pentagon was careful to say that the strikes would not render the Assad regime unable to conduct a chemical attack in the future. The intent was to degrade that capability without risk to civilians, and to send a strong message that their actions were inexcusable and that violations of the international norms regarding chemical weapons will not be tolerated. The strikes were aimed at three specific targets: a scientific research center considered to be the center of research, development, production, and testing of chemical and biological warfare technology; a chemical weapons storage facility assessed to be the primary location of Syrian sarin and precursor production equipment; and a third facility that contained both chemical weapons equipment storage and an important command post. Attacks involving both sarin and chlorine gas have been launched multiple times since last year’s strike by the United States, so did it have any impact? While the Assad regime continued its CW attacks after the United States launched its cruise missile attack on the Shayrat Air Base in April 2017, the earlier U.S. strike has had an impact. It catapulted the violation of the Chemical Weapons Convention (CWC) to the top of the global agenda in the UN Security Council, where the Assad regime and its principal ally, Russia, have not been able to coalesce international support for their denials of Syria’s use of chemical weapons and its violation of the global ban on the production, spread, and use of chemical weapons. Assad’s continued use of chemical weapons against innocent civilians has resulted in a stronger military response from the U.S. and its allies Britain and France. Chemical weapons are playing an important role in the Assad regime’s strategy to retake control of areas held by rebel forces, and his strategy parallels Saddam Hussein’s strategy towards the end of the Iran Iraq War. Two-thirds of the chemical weapons Saddam Hussein used were deployed in the last eighteen months of the war, including the 1988 chemical attack to regain control of Halabja, a Kurdish city in northern Iraq. That brutal attack against civilians mobilized the global effort to negotiate the Chemical Weapons Convention. U.S. leadership has been critical to ensuring that Assad’s use of chemical weapons and his violation of the international norm against these weapons have not been ignored by the global community. Syria’s chemical weapons program was thought to have been dismantled after Syria acceded to the CWC in 2013 to avert U.S. military reprisal, so how has it been revived? Prior to joining the CWC, Syria was believed to have one of the world’s largest stocks of nerve agent and mustard gas. Since Syria’s initial CWC declaration of its chemical weapons stockpile and capability, the United States has had concerns that the declaration was deficient. The Organization for the Prohibition of Chemical Weapons (OPCW) and other governments share these concerns. The French government just released an intelligence report detailing similar concerns about the Syrian declaration. The OPCW has been investigating gaps in the Syrian declaration with limited cooperation from the Syrian government or from the guarantor of the agreement, Russia. Verifying the declaration is also complicated by the ongoing civil war, which makes site visits difficult. The Syrians completed destruction of their declared CW stockpile, which was reportedly about 1,300 tons, in 2015. About half of that stockpile was diluted and moved to a U.S. naval ship, where it was neutralized and disposed. The remainder was successfully delivered for processing to commercial facilities in Finland, the UK, and Texas. Despite that achievement, the Syrian government continued to use chemical weapons in the civil war. The Joint Investigative Mechanism (JIM), set up in 2015 by the UN and OPCW, officially determined that the Syrian government was responsible for four CW attacks between 2014 and 2017 using chlorine bombs or the nerve agent sarin. Syria has either hidden parts of its stockpile or continued to produce it in facilities that were not declared. Syria has either hidden parts of its stockpile or continued to produce it in facilities that were not declared under the CWC. International inspectors are now in Syria conducting tests. What tools do they have to determine whether chemical weapons were used, and who was responsible for launching them? In 2014, after Syria joined the CWC, the OPCW established a formal Fact-Finding Mission, which works both in Syria and outside it to gather information and samples regarding CW attacks. The Fact-Finding Mission only has the authority to determine whether chemical weapons have been used. It does not have the authority to determine who is responsible. The OPCW uses a broad range of tools to determine whether CW has been used. These include information coming out of the area that has been under attack, such as photos, videos, and reports from first responders and survivors, as well as interviews with the Syrian government. The latest OPCW investigation will also include information from nongovernmental medical organizations active in Ghouta, including the Syrian American Medical Society and the Union of Medical Care and Relief Organizations. If the OPCW gets access to the site and to the deceased and survivors, they will also be able to take biomedical and environmental samples. The OPCW also works with states parties to the CWC, who share their intelligence on the attacks. To determine responsibility, the UN and OPCW in 2015 established a separate mission, the JIM, which was authorized by the UN Security Council. At the end of 2017, after the JIM had determined that the Syrian government was responsible for four CW attacks and the Islamic State for two, Russia blocked its reauthorization in the Security Council. The effort to reestablish the JIM has been at the center of the conflict with Russia in the Security Council. Given the bitter divisions in the Security Council over Syria, how can norms on chemical weapons be enforced? Could the outcome affect the use of chemical weapons elsewhere? Russia has been obstructing resolutions coming from the Security Council with its veto and eroding the implementation of the CWC. But the Security Council votes themselves have demonstrated that the Security Council is not divided, but rather that Russia is isolated in its protection of Syria and Syria’s use of CW. Russia is only successful because of its veto power. One of the major shortfalls of U.S. policy has been that the Trump administration did not leverage the April 2017 military strike with a broader deterrence strategy that used all instruments of power—military, economic and diplomatic—to deter Syria from using chemical weapons and to hold Syria’s allies, Russia and Iran, accountable. The United States acted unilaterally and did not mobilize the near-universal support for the chemical weapons ban. While President Trump has pledged that the United States, France, and Britain will have a broader deterrence strategy—including military, economic, and diplomatic measures—after this most recent attack, U.S. leadership must be consistent, vigilant, and widely supported over the coming months. The Syria CW challenge is a defining moment for the global nonproliferation regime. The Syria CW challenge is a defining moment for the global nonproliferation regime. Potential bad actors, including North Korea, are watching carefully. We will either build on the historic achievements of the Chemical Weapons Convention, which has resulted to date in the destruction of more than seventy thousand tons of chemical weapons agent—more than 96 percent of the world’s stockpiles—or we will reverse course and return to a much more dangerous world.